You don't want to see the controls during visualization ? Set the two opacity settings to zero. Or can could just turn visualisations off completely of course. But when i click the song , that control is appear again. How to remove them completely? To remove visualisations completely? Tap on the icon on the left-hand side underneath the cover artwork. 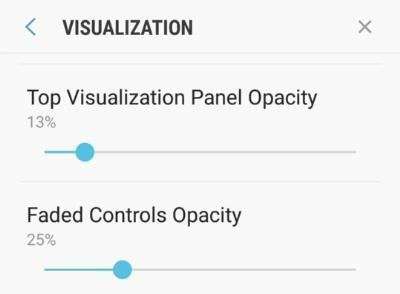 All visualisations and visualisation controls will go away. Image above all controls is hiddedn when visualisation ON, because i lower the opacity to zero as @blaubär suggestion. Nah, when i tap the song , then two controls is appear again. I want remove them (see red box), not visualisation. When you view the controls with visualisation enabled, you will see the controls for the visualisation too. The control of visualisation (upper redbox) (visualisation that installed) should in inside Poweramp setting, if its there up of the song cover, it will make UI ugly, imho. And the control like search, open settting (buttom redbox) should can be removed. Too many controls, i can access setting by press "menu" button on my phone. @maxmp Any chance to add setting to remove them??? I do tend to agree with that, Visualisation has too many spread out controls - some on the player screen and some in the Settings > Visualisations menu. It would make more sense if everything was contained in one place (including the Full-screen/Fade/Disable option being in the Visualisations menu) and thus less cluttering of the player interface. In the same way that all the other interface Look-and-Feel elements are in menus, not on the main player screen. Adding a toggle control to the player interface ought to be optional, so people who never use visualisations don't have to see it. Also, I feel Visualisations should probably be turned off by default when you first install v3 (we got a fair few comments on this subject from people upgrading from v2).